This unusual salad is a fantastic last –minute recipe if you don’t seem to have much in the refrigerator. A few long lasting ingredients, such as Cervelas, pickles and cheese, can soon be turned into a delicious light lunch or supper dish. 1. In a serving bowl, whisk together the oil, vinegar and sugar. Season well with salt and pepper. Toss the onion in the dressing and leave it to marinate for at least 15 minutes. This will help to soften the onion, in terms of both taste and texture. 2. 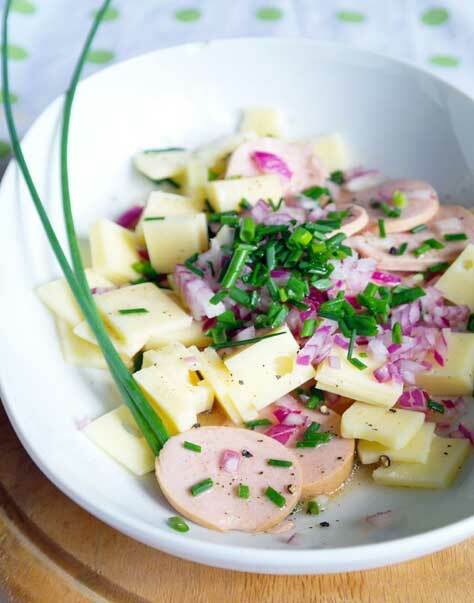 Add the Swiss Deli Cervelas, cheese, and gherkins to the bowl, and mix well to combine. 3. Sprinkle with parsley, and marinate for at least 15 minutes (up to 1 hour) before serving with green salad bread or rice.